Himachal Pradesh Chief Minister Virbhadra Singh today said the local panchayats would be provided developmental share in all the projects executed in their areas. The Himachal Chief Minister, Mr Virbhadra Singh, addresses a gathering at Manu Rangshala on the occasion of the Winter Carnival in Manali on Sunday. The five-day state-level winter carnival started here today with fanfare at Nehru Park. The Chief Minister, Mr Virbhadra Singh, inaugurated the carnival. Earlier a procession, which included jhankis, was taken out after participants visited the 500-year-old temple of Goddess Hadimba. The two-day tour of Chief Minister Virbhadra Singh, accompanied by MLAs and ministers, has enthused party workers in the Mandi constituency. Chief Parliamentary Secretary Mukesh Agnihotri, said yesterday that the Kangra region had suffered because of rivalry between BJP leaders, Shanta Kumar and P.K. Dhumal. The state unit of the BJP has accused the Virbhadra Singh government of victimising and harassing the opponents and specifically targeting party leaders. In a major step to cut down its exorbitantly high employee cost, the Himachal Pradesh State Electricity Board has decided to introduce spot billing system using computerised handheld machines. Finally the Forest Department has decided to register an FIR against the Bhakra-Beas Management Board for dumping silt into the Suketi khud. This issue pertaining to the violation of the Forest Conservation Act was highlighted by The Tribune on May 25, 2004. A direct road or rail link here has remained a distant dream despite the town emerging as a major industrial hub of the region. A direct road from Chandigarh to Baddi was planned about 20 years ago. But the project failed to materialise due to least interest shown by the governments of Punjab and Haryana. Hamirpur will have a new judicial complex soon. A new site has been finalised for it in Krishna Nagar on the Hamirpur-Nadaun highway. A three-member committee constituted by the HP High Court visited at least seven sites for the proposed complex. Despite tall claims of the police of having brought down the crime rate considerably, the increasing involvement of migrant labourers in crimes have posed a danger to the law and order situation in the area. The houses of Piar Singh, Sahab Singh and Prem Singh were gutted when a fire broke out at Bhagatpur village under Talai police station, near here, last night. Property worth Rs 12 lakh is said to have been damaged in the fire incident. 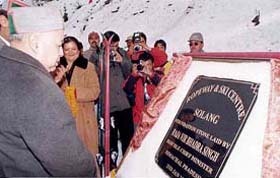 While addressing a public meeting after laying the foundation stone of a ropeway being constructed at Solang Nullah near here, he said the government had made it mandatory for all project executors to make fair provision in the project cost for development of the area thereby becoming partners in the socio-economic development of the area. He said the government had made it mandatory for all private entrepreneurs to provide at least 70 per cent employment to local people as per their qualification and experience. The CM said tourism development in the state was being done by ensuring that environment in the area was not disturbed. He said Solang Nullah was known for winter sports and necessary infrastructure was being created to facilitate the sportsmen and visitors to the valley. He said with the construction of the ropeway, setting up skiing facilities at higher reaches would be possible and this would attract not only the tourists but also winter sport enthusiasts. The CM said the ropeway authorities would spend Rs 12 lakh on three panchayats of Palchan, Burua and Shanag for development of the area. Mr Ashok Thakur, Principal Secretary, Tourism and Forests, said the project would be completed within 14 months. The five-day state-level winter carnival started here today with fanfare at Nehru Park. The Chief Minister, Mr Virbhadra Singh, inaugurated the carnival. Earlier a procession, which included jhankis, was taken out after participants visited the 500-year-old temple of Goddess Hadimba. At least 22 folk troupes will participate in cultural programmes. As many as 800 participants would entertain the crowds that are expected to gather at the Ram Bagh stadium. The highlights include folk dances, folk songs, personality contests, skits, fancy dress competitions, fashion shows, street play, classical dance, and rangoli. The main attraction of the carnival will be the “winter queen contest. The Chief Minister said the government was pursuing construction of the Rohtang tunnel with the assistance of the Centre. He said recently he called on the Prime Minister Dr Manmohan Singh in this regard. He said the government was giving priority to sewerage in all tourist destinations and towns. He said the treatment plant of the Manali sewerage system had got washed away during the Beas floods in 1995 and it had been reconstructed. He appealed to the people to donate liberally for the tsunami victims. He said the people of the state were known for their generosity and kindness and hoped that they would come forward to donate liberally towards the Chief Ministers Relief Fund which would be transferred in a consolidated manner to the Prime Minister’s Relief Fund. He directed the authorities to construct the Manali bypass expeditiously. He directed the department concerned to start construction on an office building at Manali on a priority basis to facilitate people to avail administrative facilities at one place. The Chief Minister was handed over a cheque for Rs 66,962 by the office of the District Commissioner, Kulu as the one-day salary contribution of employees. A sum of Rs 5135 was given by the DRDA, Kulu and Rs 5000 by the Sutradhar Kala Sangam. Though Mr Virbhadra Singh made no major announcement as expected, he listened to the grievances of the public. Mr Virbhadra Singh undertook the tour along with his wife and member of Parliament Pratibha Singh, the Irrigation and Public Health Minister, and the Drang MLA, Thakur Kaul Singh, the Excise and Taxation Minister. Mr Rangila Ram, who is also the Congress MLA from Gopalpur. Mr Sukh Ram, Mandi Sadar MLA was conspicuous by his absence. But his son and a former Rajya Sabha MP was part of the Congress cavalcade. Targeting the BJP bastion — Balh constituency — Mr Virbhadra Singh urged farmers not to use the fertile land for mining. He announced the opening of the PWD subdivision at Balichowki. Mr Virbhadra Singh took a dig at the Dumal-led BJP regime, accusing it of regionalism. The Congress has seven MLAs from Mandi, almost all Mr Virbhadra Singh loyalists, and the BJP has three from Dharampur, Balh and Chachiyot. Mr Virbhadra Singh managed to reach out to the younger lot at the HP Golden Jubilee Games, that he presided. He declared that he would complete the Tarantal swimming pool and the bus stand complex in the near future. Addressing a press conference here, he lashed out at the BJP for terming the proposed winter sojourn of Mr Virbhadra Singh to Kangra and other lower parts of the state as a mere formality. “It is a tradition started by Mr Virbhadra Singh to bring the government and administration at the doorstep of the people of lower areas of the state. Calling it a formality amounts to insulting them,” he said. Mr Agnihotri said the people of Kangra had suffered the most due to the rivalry between former Mr Shanta Kumar and Mr Dhumal. “Mr Dhumal, during his tenure as Chief Minister, ensured that the pace of development in Kangra slowed down, as it happened to be the home district and citadel of his archrival, Mr Shanta Kumar,” he remarked. On the issue of granting the status of winter capital to Dharamsala, Mr Agnihotri said a large number of offices and institutions had been opened there by the Congress regime and it was being ensured that uniform development of all parts of the state was done. “Granting capital status cannot be an overnight affair as it would involve a huge amount and even relatively affluent states like Punjab and Haryana are carrying on with a common capital town,” he explained. Mr Agnihotri said the Chief Minister would spend over a month in Kangra in two phases. The districts of Una, Chamba and Hamirpur would be covered by him. Mr Jai Ram Thakur, vice-president of the party, said the BJP leaders and their supporters were being subjected to political vendetta. They were either being implicated in false cases or harassed by ordering vindictive transfers. He said the latest victim was Mr Randhir Sharma, spokesperson of the party, the appointment of whose wife as lecturer in Himachal Pradesh University was being probed. The fact was that she was appointed during the Congress regime in 1996. He said this clearly indicated that the government was bent upon harassing BJP leaders and could go to any extents to achieve this end. Questioning an appointment made during Virbhadra Singh rule only underlined the fact that irregularities were committed in recruitment when the Congress was in power. He said the strategy of the Congress government was to target the leaders who exposed the “misdeeds” of ministers and officers. It also indicated that the Congress had no faith in democratic norms and traditions. He said such tactics would not cow down the BJP leaders who would continue to play the role of an effective opposition. The board has already successfully tested the machines, which generate and print the electricity bills on the spot, in the Khalini subdivision. The spot billing system will not only eliminate bill distributors but also save the board a lot of clerical work as the machine, weighing just 700 gm, directly transfers the data to computers installed in various billing centres. At present meter readers visit the houses and establishments of consumers to record the meter reading. The data is then posted in ledgers at the billing centres. Thereafter bills are generated and delivered to consumers by distributors. While the board is on an average spending as many as Rs 57 on delivering a bill, there are over 1.50 lakh domestic consumers, including about 80,000 Antyodaya families who are charged at the rate of 70 paise per unit, whose monthly charges are even less than the cost of billing. In all the state has over 13.60 lakh domestic consumers who are supplied about 90 crore units of energy annually worth over Rs 180 crore. The cost of billing for the domestic consumer category comes to about Rs 50 crore, more than 25 per cent of the revenue collected. With such high cost of billing, it is hardly surprising that the employee cost of Rs 1.33 per unit is the highest in the country. In Uttranchal , which is a hill state like Himachal Pradesh the employee cost is as low as 13 paise per unit. In states like Andhra Pradesh, where reforms had been implemented sincerely, it has come down to 16 paise per unit. It was about 40 paise per unit for Delhi. Even in the neighbouring states like Punjab the employee cost , which was on the higher side, came to 57 paise per unit. The state electricity regulatory authority has in the past two tariff orders directed the board to take effective measures to bring down the employee cost like installation of bill payment machines and pre-paid metres. The spot billing system when fully operational will bring the cost down to about Rs 20 per bill. Besides, the consumers will get bills free of errors well in time. There will be no complaints of wrong billing, as the meter reader has no option but to visit the consumer and take the actual meter reading. In the past meter readers have been at times recording readings without visiting the consumers, which led to numerous complaints and avoidable disputes. Moreover, the machine also records the date and time at which the bill is generated. It helps in monitoring the daily movement of the meter reader and, which in turn, improves the efficiency. The 990 mw Beas-Sutlej link project, which is run by the Bhakra-Beas Management Board, has been throwing silt into the Suketi khud for the past more than two decades. As a result, aquatic life in the khud waters has been destroyed while the silt has ruined the most fertile Balh valley of this hill-state. As per the provisions of Forest Conservation Act, 1980, forest land cannot be used for non-forest purposes without the permission of the Centre. Suketi khud is in forest land as per a notification issued by Himachal Pradesh. In 1977 when the Beas-Sutlej project was commissioned, the Forest Conservation Act was not enacted. Afterwards, the Forest Department wrote many letters to the Chief Engineer, BBMB, not to throw silt into the khud, giving references of various judgements of the Supreme Court. But the BBMB says the provisions of the Forest Conservation Act are not applicable to it. The BBMB has written to the Conservator, Forests, Mandi, that the judgement of the Supreme Court referred to is not applicable in the matter and the BBMB is doing various works as per the provisions of the Punjab Reorganisation Act for which no approval under the Forest Conservation Act is required. The Conservator of Forests, Mr C.S. Singh, vide letter dated December 20, 2004 to the Chief Engineer, BBMB, has written that the BBMB is interpreting the Supreme Court verdict in a wrong manner. If the order is not complied with, the department will lodge an FIR against BBMB officials, he has warned. When contacted, Forest officials said the department had issued notices to the BBMB regarding the issue. Sources said the department would further calculate the area where the silt was being dumped and issue a bill against the BBMB for using forest land for non-forest purposes. The amount would be Rs 5.80 lakh per hectare. As per the notification issued in pursuance of the orders of the Supreme Court, orders had been issued to calculate the area where the silt was being dumped so that the penalty could be raised. None was ready for comment on behalf of the BBMB. A direct road or rail link here has remained a distant dream despite the town emerging as a major industrial hub of the region. A direct road from Chandigarh to Baddi was planned about 20 years ago. But the project failed to materialise due to least interest shown by the governments of Punjab and Haryana. This road will reduce, the distance between Baddi and Chandigarh by 30 km from the existing 50 km. The Baddi-Barotiwala-Nalagarh Industries Association (BBNIA) has taken up the matter with the Union Surface Transport Ministry but nothing has happened yet. A special task force should be constituted under the chairmanship of the HP Chief Minister to take up the matter strongly, said Mr Rajinder Guleria, president of the BBNIA. The representatives of the CII and even of the association should also be made a part of this task, he added. To facilitate the movement of goods within the state industries, the Baddi -Parwanoo link road was an urgent requirement. Due to the lack of direct link road one has to pass through Haryana involving two barriers thus putting more traffic on the Kalka-Shimla national highway. There was also a need to pay attention to the repair and maintenance of internal roads of Baddi whose condition had gone from bad to worse. With heavy industries setting up their units at Baddi, the rail link to Baddi has now become an urgent requirement. The extension of rail-link up to Nalagarh was quite feasible as during the British period, a material train was used to ply between Nalagarh and Bharatgarh. As per railway officials there was vast potential of railway traffic from Baddi area. The BBNIA feels that the matter should be highlighted jointly by all MPs of the state with the Union Government. Hamirpur will have a new judicial complex soon. A new site has been finalised for it in Krishna Nagar on the Hamirpur-Nadaun highway. A three-member committee constituted by the HP High Court visited at least seven sites for the proposed complex. The final selection was made at a meeting held in the office of the Deputy Commissioner here last evening. Deputy Commissioner Devesh Kumar said here today that the recommendations of the committee would be forwarded to the High Court for final action. He said the Krishna Nagar site had been found most suitable will an area of 15 kanals surrounded by pine trees. However, President of the District Bar Association Rajeev Soni disagreed. He said the proposed site was not acceptable to the bar as it was far away from the revenue complex and the main town. He told The Tribune that the Bar Association favoured a site near the mini secretariat here. The bar would send its report to the High Court too, he said. The High Court had directed the Deputy Commissioner, following a PIL, to find a new site for the separate judicial complex at Hamirpur. Local members of the bar had met the Chief Justice at Hamirpur recently and requested for more accommodation. Accordingly, the order was passed. Though initially the migrant labourers were involved in small time crimes, but now serious crimes were coming to light involving them. Migrant labourers were being booked under the Narcotic Drugs and Psychotropic Substances (Prevention) Act, the Excise Act and the Gambling Act and their involvement in burglaries and thefts had now become the order of the day. There was no accurate information available on the population of the migrant labourers. The industrial belt of Parwanoo, Baddi and Barotiwala was alone employing thousands of migrant labourers. Besides, the migrant labourers were actively involved in farm work in the area. They used to change their work places regularly based upon the work requirement. The police measures to register the names and addresses of the migrant labourers residing in the area seemed to have failed in yielding desired results, as most of the migrant labourers were not registered. Inquiries made from different police stations in the area showed that every police station had maintained a register to record information about migrant labourers. But most of the migrant labourers had no records of any sort in registers. It was very difficult to maintain the record of the migrant labourers due to their heavy arrival in the area over the past few years, asserted the pradhan of a panchayat. The migrant labourers were not alone responsible for their involvement in crime, pointed a social worker. These people hardly had a good social background, social bindings and hardly had a good living standard. The houses of Piar Singh, Sahab Singh and Prem Singh were gutted when a fire broke out at Bhagatpur village under Talai police station, near here, last night. Property worth Rs 12 lakh is said to have been damaged in the fire incident. The cause of the fire could not be ascertained immediately, though some villagers claimed that they saw these houses afire just after lightening struck. The Gehadwin MLA, Dr Biruram Kishore, accompanied by the SDM, Mr Pardeep Thakur, visited the scene of fire and gave immediate relief of Rs 15,000 to Piar Singh, Rs 10,000 to Sahab Singh and Rs 5,000 to Prem Singh. The affected families were also given kitchen utensils, beddings, clothes and other household requirements by the Shahtalai Temple Trust. Dr Kishore said that the Forest Department had been told to supply timber to these families for construction of their houses.